i played through donkey kong jr. earlier this year, and i finally filled in a gap in my video game experience by playing through the often-ignored follow-up, donkey kong 3 on NES. those two NES versions, along with the NES version of the first donkey kong game were all based on arcade releases, and they were all released at the same time in north america (june 1986). although DK jr. has vague similarities to the first donkey kong game, the same can’t be said for this release. as has often been noted, in those early days carbon-copy sequels weren’t churned out with nearly the same alacrity as nowadays, and i came to DK3 with very little previous knowledge outside of seeing a screenshot or two. the first two games are platformers with an emphasis on running and jumping, but i was surprised to find out that DK3 is actually more of a shoot ’em up. there’s a lot of interesting gameplay packed into the single-screen arcade experience. the setup is that DK has invaded “stanley the bugman”‘s greenhouse, and stanley, armed only with his trusty bug spray, has to get rid of DK and exterminate the bugs in order to save his plants. 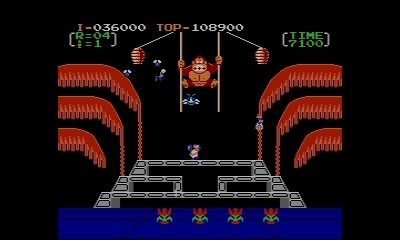 the player has to juggle several objectives at once: spray DK enough times to make sure he doesn’t descend far enough to attack stanley himself (thus losing a turn) (stanley can use his bug spray to push DK up off the screen and to the next level in every first and second level of a cycle, and get his head stuck in a beehive in every third level); spray individual bugs that fly around, each with unique behaviors; spray worms that crawl along and can’t be defeated but will pause if hit, often impeding progress; and in a mechanic somewhat similar to defender, make sure none of the bugs make off with any of the five plants, which provide bonus points if they’re saved. once per turn there’s also a can of super spray, the game’s equivalent of an uzi, that basically gives you a free pass through the next couple of levels. in terms of the pace the game is pretty typical old-school arcade style in that there are only three levels and they loop pretty much infinitely. this game does introduce new enemies at various points, providing slightly more of a progression than some of the other games which increase difficulty by just adding more and faster enemies. like other classic nintendo NES games of the time, there’s a harder mode (“game B”) that can be selected from the start screen, and an alternating two-player mode. all in all i enjoyed it overall, and the game provides a fairly satisfying, if somewhat uneven, amount of challenge and fun. i wouldn’t say it’s become a great favorite, but it’s an interesting curio in nintendo’s catalog and should be more interesting to fans of shooters, classic arcade gameplay, and/or the donkey kong series, but i imagine most others would find this to be too old-school to spend much time with. 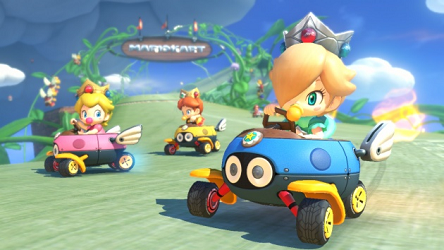 – nintendolife has reviewed the wii, 3DS, and wii u virtual console releases of the game. the 3DS VC review is the most positive of the three. – entry at strategywiki.org, which includes a guide and descriptions of all the enemies as well as differences between the arcade and NES versions. dr. luigi was a surprise nintendo direct announcement at the tail end of last year that added another game starring our favorite plumber in green (and now doctor, insert joke here) to the year of luigi festivities (although related events continued through this year, even after miyamoto declared its official end in march). the release of dr. luigi can be viewed in several ways. yes, it’s an obvious ploy to add yet another iteration of the dr. mario series, previously most recently seen on wiiware, in late may of 2008 and DSiware, about a year later, and the game does reproduce almost identically almost all the modes of the wiiware release. 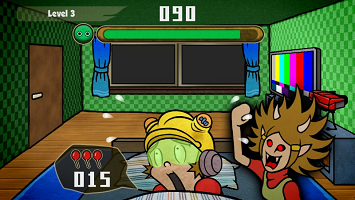 the game also recycles the touchscreen controls, originally seen in brain age 2 on DS and which made a reappearance in the latest brain age game, brain age: concentration training on 3DS. on top of that, the game is available via various VC releases of the original NES and GB versions. with all these options, for casual players it seems a bit hard to justify yet another iteration of what has essentially been the exact same game even though three and a half years have elapsed since the last full release, esp. since the wiiware version is playable on wii u, although it makes more sense given that nintendo’s wi-fi service for wii (and DS) is shutting down in a few days. the presentation is similarly barebones as the previous wiiware and DSiware releases: developer arika, perhaps most known for their 3D classics releases, just don’t give the games they work on much personality, even taking into account that they’re often adaptations of previous games. (although, there’s a trio of new viruses in pastel versions of the original colors — and featuring a female virus for the first time — and a couple of new tracks). virtually all the reviews i’ve seen online have dismissed the “operation L” modes (i.e. new luigi modes) as nothing more than a gimmick, but the mode should be more appealing to newbies and dr. mario aficionados. the reason newbies should enjoy it is because on the low and medium difficulty levels it makes it much easier to form a group of four (because the L-shaped pills consist of 3 of the same color together), and thus makes the game much faster paced. the reason aficionados will enjoy it is because in general it makes you rethink your strategies, but on the hard level the game completely changes and the true brilliance of it really becomes apparent. at this level the L shapes don’t have 3 of the same color together, so clearing the board requires much more consideration. this elevates the new mode past the luigi gimmick and makes it the first true expansion to the dr. mario series’ mechanics in 23 and a half years. it seems like most reviewers didn’t spend enough time with the operation L modes to discover how worthwhile it really is, and nintendo could have done a better job of making it more apparent (with mission and/or puzzle modes) and otherwise rounding out the $15 package with other equally fresh gameplay to make it feel more complete. even though the true worth of the game will probably remain lesser known i suppose it’s somehow fitting since luigi himself has always flown a little under the radar. 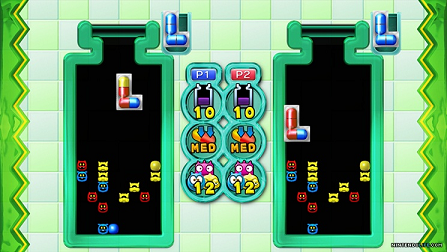 still, the game is an easy recommendation for people who don’t already have one of the many versions of the game, for dr. mario vets who are eager for new wi-fi battles, and for long-time dr. mario fans who are willing to invest in the time to uncover and enjoy the more challenging aspects of the new luigi modes. wrecking crew, one of the earliest NES titles, was one of those games that i had vague memories of seeing at a friend’s place growing up but that i didn’t really remember anything about. more recently the game was one of the 3DS ambassador games, not to mention the wii and wii u virtual consoles, and was also one of the games included in NES remix, so there have been plenty of opportunities to revisit it. i finally sat down and gave the game a spin, and overall i was pleasantly surprised. 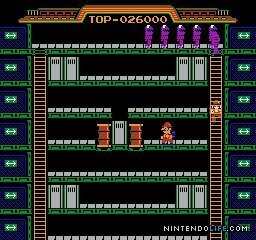 in terms of mechanics and presentation the wrap-around stages slightly recall the original mario bros., and mario (and luigi’s) squeaky shoes and hammer recall the original donkey kong, but the game is wholly unique in that it’s one of nintendo’s earliest forays into the puzzle genre. it does so with character, and the game features a construction site setting and two types of enemies: one, a cross between a wrench and a dragon, and the other, an eggplant with safety glasses, along with fireballs that appear at regular intervals (also taken from the original mario bros.). 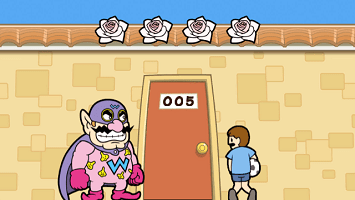 in addition, the game features a unique mechanic where a “foe”, named spike the foreman (generally considered to be a predecessor to wario, the anti-hero), runs around and tries to trip you up, often literally. 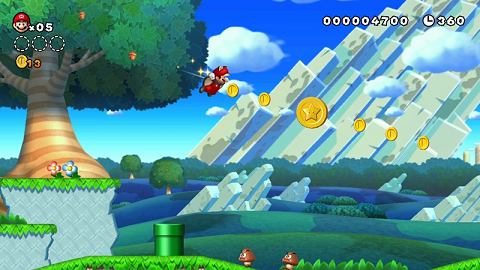 the game is also unique in that it features a stage select which allows you to start from any of the 100 stages, a quick reset via the select button (although doing so causes you to lose your current score), and a level editor. in the original edition you could save your creations, but the US didn’t see that feature reinstated until its rerelease on virtual console. in terms of my experience, in general i enjoyed the game. like a lot of great puzzle games, wrecking crew makes the most of its limited number of elements, providing surprisingly sophisticated challenges out of relatively simple mechanics. limiting the types of elements in the board (basically destructible and indestructible walls and ladders, plus bombs) and the number of enemies makes it easier to internalize their use and behavior, and the game does a pretty good job of mixing up the types of stages: some are clearly more about working out the right order of actions, whereas others are more pac-man or burgertime-like and require finesse in avoiding the enemies while trying to navigate around the board to accomplish your objective. although i enjoyed my time with the game, after getting through half of the 100 stages i felt like i’d seen everything there was to see. it’s fun to work out just the right strategy to trap enemies, and watching videos online it’s been interesting to see how different people come up with different approaches. the “theme and fun” (as nintendo power would put it) is pretty good, and the game definitely gets kudos for being one of the first of its kind. the bonus level is a matter of luck and feels superfluous, and the ease with which you get stuck and have to reset and thus lose your high score feels a bit cheap and pointless by modern standards. the game includes some replayability in the form of hidden “M A R I O” letters, revealed by destroying blocks in a specific, oftentimes completely nonintuitive order, on some stages, but doing so only provides 1-ups and provides only a minor diversion. similarly, uncovering special bonus items by destroying bombs in some stages is also fairly random (apparently the exact item uncovered is a function of the number of times you’ve swung your hammer), and so although getting a golden hammer (of smash bros. fame) is fun, it’s such a rare and random occurrence that it seems like an after thought rather than a worthwhile feature. 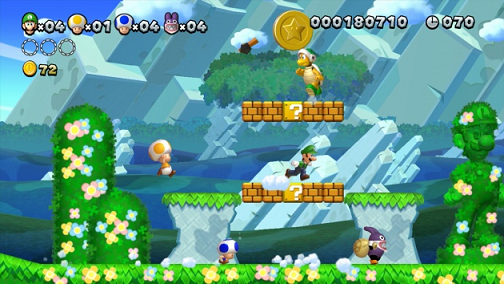 all in all a decent successor to the original mario bros. and a game worth playing. – apparently there was a japan-only sequel? ?